Cities are clogged with hipsters trying to forget childhood in the burbs. But a pair of Boston executives, craving more space for their own young family, went in the opposite direction. In the leafy bedroom community of Newton, Massachusetts, the two men bought a raggedy brick Tudor built nearly a century ago—for a wildly different lifestyle. “There were a lot of little rooms in the wrong places,” architect David Hacin explains. Reshuffled by Hacin + associates, the 3,600-square-foot layout now allows the parents and their daughter to float through effortlessly. The dark wood-paneled study was repurposed as a dining room, painted white. The kitchen, once closed-off at the rear, shifted to a side location—thus making way for a rear family room, which benefits from its direct connection to the backyard. Upstairs, one small bedroom became the master suite’s combination home office and walk-in closet. Because the owners detested the staircase balustrade’s elaborate mock-Tudor wrought iron, Hacin replacedit with a streamlined version with blackened-steel balusters and an oak handrail. 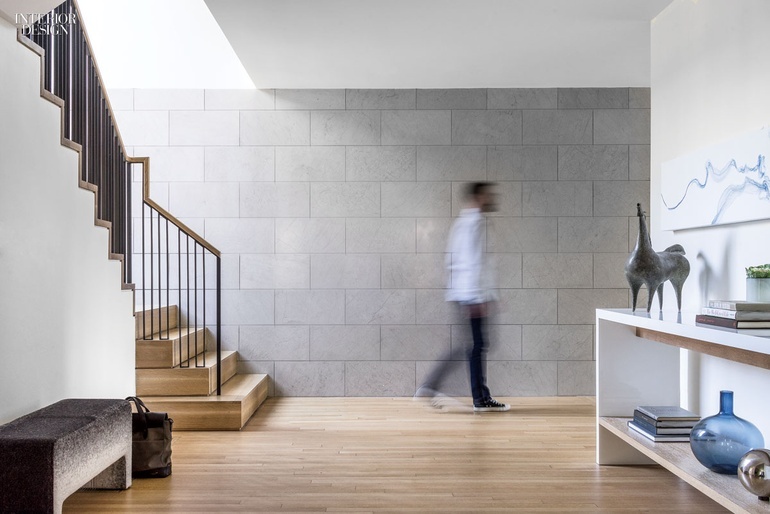 Anchoring the stair, the foyer gained a wall clad in running-bond limestone tiles and a low white-lacquered shelving unit loaded with contemporary accessories and sculpture. Hacin flattered and even amplified some other ye olde details, however. The living room’s baronial cast-stone mantelpiece stands out against an otherwise unembellished wall. Next to the fireplace sits an Eero Saarinen–inspired Rodolfo Dordoni chair, jazzed up with super-scale tartan. Project Team: Eduardo Serrate; Jennifer Clapp; Katelyn Miersma.